Will a new Venezuelan government adopt the right policies when Maduro is finally evicted? I listed the collapse of Venezuela’s socialist dictatorship as one of my “hopes” for 2018. That didn’t happen, so I included the same hope in my list for 2019. But will it happen? David Asman seems very confident in this clip from a recent interview. I was a bit less hopeful. Or at least more guarded in my ability to predict. Is There Any Hope for Venezuela? But one thing I can state with full certainty is that I hope it happens as soon as possible. Though I have become a bit jaded. I no longer share lengthy compilations of everything that is going awry in the country. As far as I’m concerned, the real debate is now whether a new government will adopt the right policies when Maduro is finally evicted (in other words, is there any hope for Chilean-style economic liberation?). But there are a couple of stories and columns about the ongoing crisis that caught my eye. Especially ones written by Venezuelans. Andres Malave wrote for Investor’s Business Daily about what has happened to his country. Venezuela’s misery means that it is not uncommon to see children rummaging through the garbage for food. And as basic medical supplies and medicine run dangerously low, newborns and the elderly die unattended in Venezuelan hospitals. 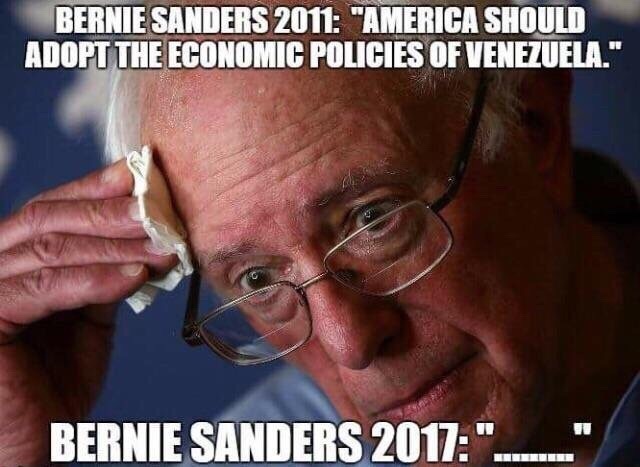 …In a 2006 column, Sen. Sanders wrote: “These days, the American Dream is more apt to be realized in South America, in places such as Ecuador, Venezuela and Argentina,” all practitioners of 21st century socialism. …What’s particularly galling about Sen. Sanders waxing poetic about the virtues of socialism is that he looks the other way as socialist leaders live in opulence while the masses starve. A retired professor who still lives in Venezuela explained the wrenching descent of his nation in the U.K.-based Spectator. The descent began in the early 2000s when the Hugo Chavez government began to take control of…private companies, the judiciary and the police. The descent turned into a nosedive when Nicolas Maduro came to power and the state tightened its grip on oil production, our country’s main source of revenue. Investors fled and skilled workers emigrated. As living standards plummeted, the response was to print more money. Hyperinflation has been the result. …my friends and relatives have lost a lot of weight. We call it the 'Maduro diet'. …Not so long ago, I lived as you do. I would have thought it impossible that my country, with its hard-won progress, could fall so quickly into the abyss. The wrong politicians with the wrong ideas can have a bigger effect than anyone can imagine. I don’t want to discriminate against non-Venezuelans, so let’s look at excerpts from some other authors. Chávez fans frequently emphasised the many ways in which Venezuela differed from the old Eastern Bloc. They were especially proud of the fact that there was no apparent conflict between socialist economics and political democracy. They also pointed out that the Chávez government, rather than just nationalising lots of big companies like the socialists of yore, was experimenting with lots of different models of social ownership, looking for alternatives to both private enterprise and conventional state-owned enterprises. And they were right. Chávez and Maduro never tried to imitate the former Soviet Union or any of its allies. They tried, really hard, to build something new. And look how that turned out. …Previous socialist experiments have gone through the same honeymoon period as Venezuela, during which they were widely and enthusiastically praised by Western intellectuals. Actually, I’m open to the argument that what happened in Venezuela was a different form of statism. Though the end result is always the same. In the case of Venezuela, it’s like Atlas Shrugged in real life. In a country already trudging through a serious humanitarian crisis, the collapse of the electric grid is a final catastrophe. Venezuelans were already chronically hungry, with large numbers reporting they lost weight because they could not afford enough food. …The stories coming out of hospitals up and down the country have been harrowing. Only some had working back-up generators, and virtually none were designed to carry a whole hospital over many days. A video of a nurse using a hand pump to try to keep an infant alive has been circulating on social media. Thousands of kidney dialysis patients, unable to receive treatment, may face a slow and agonizing death. …the Maduro government has blamed U.S. sabotage for the power crisis. …sabotage accusations against the United States lack any semblance of credibility: Venezuela’s power grid has been in gradual decline for over a decade. …over the past 12 years, the government has run the grid into the ground. After nationalizing the utility companies, the government simply stopped investing in routine maintenance of power stations or transmission lines, setting off a slow deterioration that has made the grid unstable for years. A story from Fox looks at the wretched circumstances of ordinary Venezuelans. Women sell their locks to local wigmakers in Colombia for around $10-30, depending on length and quality. Other women sell their bodies. Girls as young as 14 line the Cucuta streets available “for hire,” earning around seven dollars “per service.” …more than 55 percent of the healthcare professionals – doctors, nurses, and others – have left the country. Resident doctors who have stayed in Venezuela earn the equivalent of $24 a month, while specialists make just a little more, at $30. I’ve saved the worst for last. BBC reports that Venezuela has become such a basket case that graves are being robbed. At Caracas’s largest cemetery, Cementerio del Sur, most of the graves have been looted, for jewellery, gold teeth, or even bones, which can be sold for use in rituals. For grieving relatives like Eladio Bastida, who checks on his wife’s grave every week to make sure it’s not been looted, the situation is a metaphor for that of embattled Venezuela as a whole. As far as I know, Venezuela has yet to experience cannibalism, so I suppose things can still get worse. But that begs the question. Why did Bernie Sanders and other leftists and socialists lavish so much praise on Venezuela? And now that the chickens have come home to roost and the economy has collapsed, why are they dodging questions about their past support? Most important of all, why do they want similar policies for the United States?! ?